Having trouble with a detector component? Or you think a key machine component might be getting damaged? At the start of this year, the EN-MME group’s Materials, Metrology and Non-Destructive testing section (MM) acquired a brand-new tomograph that offers comprehensive soundness inspections for materials and performs accurate metrology. This new, non-destructive testing instrument is used to look inside materials and detect faults (cracks, porosity, inclusions, etc.) or to visualise any internal structures that are not physically accessible. Until now, the MM section had only one, tailor-made tomograph that was solely used to check the LHC magnet interconnections. It had to call on outside external companies or laboratories to perform tomography-based inspections of materials. The microtomograph made visible the internal structure of ATLAS’s microchips, which are sealed in plastic boxes, revealing nonconformities that may have been caused by short-circuits or faulty connections. With a penetration depth of approximately 50 mm for steel, 300 mm for aluminium and slightly more for polymers, this new tomograph can be used to test samples up to 430 mm in diameter and 800 mm high, weighing up to 50 kg. The sample to be tested is placed in between an X-ray source and a CCD detector and then X-rayed from all angles. “The tomograph takes a set of X-ray images - up to 4200 for a single scan - and these are reconstructed to obtain the 3-D volume of the object,” explains Ahmed Cherif, head of CERN’s metrology laboratory. “The volume can then be viewed as a 3-D video showing the different axes and layers, and this allows anomalies to be detected. 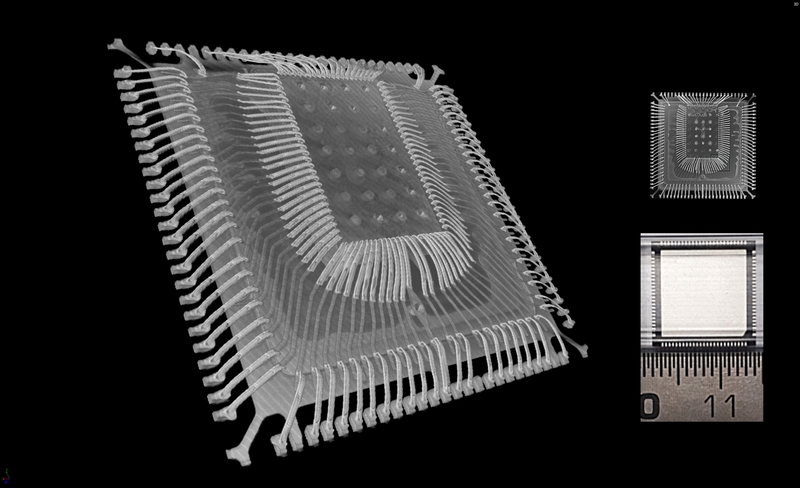 For small objects, the reconstructed image has a resolution as high as 4 micrometres,” adds the head of the non-destructive testing service, Gonzalo Arnau Izquierdo. “The tomograph is capable of producing this level of resolution thanks to its microfocus X-ray tube and its large-surface imager.” The imager can also render a wide range of shades of grey, 65 535 to be precise. By comparison, a human eye can only distinguish 256! Prototype of a power coupler for the crab cavities, produced in titanium using a 3D printer. The X-ray microtomograph is an excellent tool for developing 3-D printed components in CERN’s metallic additive manufacturing laboratory. It also performs highly accurate measurements of the dimensions of components - on the inside as well as on the outside - and allows checks to be made to see if porosities have appeared during the manufacturing process. In the framework of the European project ARIES, 15 molybdenum-graphite threaded samples were examined with the microtomograph in order to detect possible internal defects to be correlated with the results of dynamic test checks. It was concluded that none of the samples presented internal cracks at the level of the voxel resolution used – 10 microns. Instead, small amounts of molybdenum-titanium carbide agglomerates were detected in some of them, and studied in more detail. However, the small fraction of agglomerates found does not affect the properties of the material to be employed in the project. 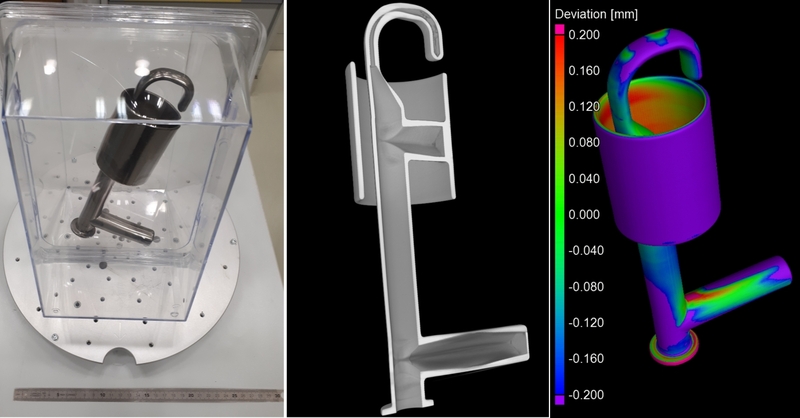 To see this new tomograph in action as well as the other instruments of the metrology laboratory, don’t miss the open day organised by the metrology and non-destructive testing teams on 6 June from 9.00 a.m. to 3.00 p.m. Coffee and croissants will be served.